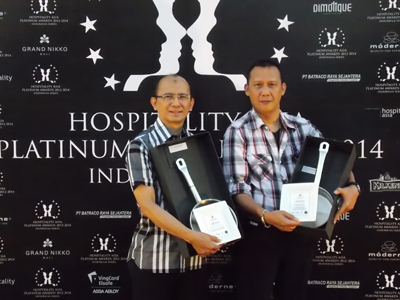 Jakarta, August 19th 2013 - As a notable achievement in only its fourth year, ASTON Primera Pasteur bagged itself two prestigious accolades at the esteemed Hospitality Asia Platinum Awards (HAPA). Triumphing in the "Major Awards" and "Personality Awards" categories respectively, the Bandung hotel was awarded the HAPA Hotel of the Year accolade, as well as the "HAPA Master Chef" award represented by Executive Chef, Willy Nursasil. The exclusive Awards Presentation Ceremony marked the grand finale of the HAPA Indonesia Series 2012-2014, which was held at the Serenity Beach of Grand Nikko Bali on Friday 16th August 2013. It was here that the contemporary 4-star ASTON Primera Pasteur hotel won both awards for which it was elected, chosen after a diligent judgement process of site inspections, interviews and food tastings over the course of almost a year. Evaluations were carried out by a discerning Panel of Judges, consisting of respected and experienced individuals from the industry as well as the corporate and business worlds, before the favoured winners were selected. "These awards would not be possible without the excellent service and strong commitments from our fantastic team members, as well as the endless support and cooperation from the owning company, PT. Wisma Resortama Propertindo and the managing company, Archipelago International" says General Manager of ASTON Primera Pasteur, Iwan Rismawardani. HAPA recognizes and rewards the crème de la crème of the hospitality industry at all levels. Focusing on the people who strive ceaselessly to give guests the best hospitality experience bar none, this signature soiree has become a much-anticipated event and is dedicated to recognizing and rewarding personalities and establishments who have shown drive, dedication and passion for the hospitality industry. The Aston Primera Pasteur Bandung is a modern 4-star hotel offering unsurpassed value and a wide range of facilities to suit the needs of conference delegates, corporate business travelers and leisurely family holidaymakers. Boasting a convenient location close to the city's shopping area and international airport, the professional hospitality and services at ASTON Primera Pasteur are synonymous with the award-winning Aston brand.